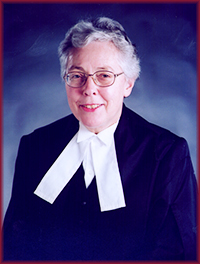 The Honourable (retired) Chief Justice Constance R. Glube passed away on February, 15, 2016. She was 84. Chief Justice Glube had retired in December of 2004 after 48 years in the legal profession; 21 years as a lawyer and another 27 years as a Judge. She graduated from the Dalhousie University Law School in 1955 and was called to the Nova Scotia Bar the following year. She was first appointed to the Bench in 1977, the first woman on the Supreme Court of Nova Scotia. But that wasn't her first "first" and it wouldn't be her last. Constance Glube - "Connie" to her colleagues and friends in the Judiciary - was also the first woman to be appointed as a Chief Justice of a Canadian Court. It was in 1982. The Nova Scotia Supreme Court's first woman Judge became its Chief Justice. And not long after that, in 1998, she was appointed Chief Justice of Nova Scotia and of the Court of Appeal. Born in Ottawa in 1931, she earned her BA at McGill University and followed that with a law degree from Dalhousie University in 1955. She was called to the Nova Scotia Bar the following year. She practiced in Halifax at the law firm of Kitz Matheson, and later as a partner in the law firm of Fitzgerald and Glube, before joining the legal department at Halifax City Hall in 1969. Six years later, she became Halifax's city manager, the first woman to hold that position in any Canadian city. But Chief Justice Glube's steadfast dedication to overcoming the gender, ethnic, and religious barriers of her era did not start there. As a Jewish woman living in the Canada of the mid-19-hundreds, her story is one of a life-long commitment to the principle of equal opportunity in her community and in her chosen profession. And the community and the profession noticed. In 1997 she was one of the first recipients of the Frances Fish Women Lawyers Achievement Award. The Award was established in honour of Frances Fish, the first woman to graduate from Dalhousie Law School and Nova Scotia’s first woman lawyer. That was in 1918, when women were still not considered “persons” under the law. The Frances Fish Women Lawyers Achievement Award is presented to women who have achieved professional excellence and demonstrate “... a commitment to the advancement of women's equality in or through the legal profession”. In 2009, the Nova Scotia branch of the Canadian Bar Association established the CBA Spirit Award in her name. The Constance R. Glube CBA Spirit Award recognizes " ... achievement in law by Nova Scotian women lawyers".